This module can collect various information about an exception and the users system such as Kodi and Python versions, etc. and submit it to a url. 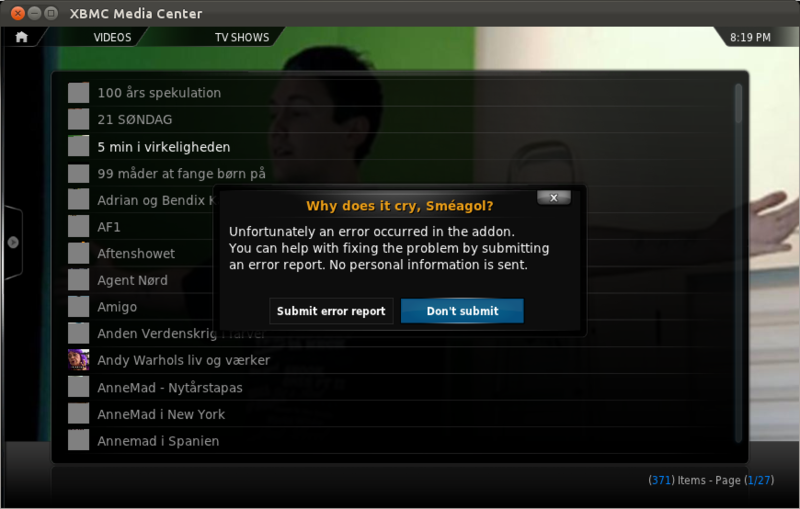 The buggalo script can collect various information about an exception in a Python script as well as information about the users system, such as XBMC and Python versions. The collected information is then posted to the internet at a predefined URL where the addon author can investigate the exception. The script is somewhat similar to posting the xbmc.log to pastebin, but is more specialised and doesn't contain superfluous information. It is also better integrated into the user experience, the user only has to decide if they want to submit the bug report or not. To use this script you must do two things besides importing it. Set buggalo.SUBMIT_URL to a full URL where the collected data is submitted. For plugin type addons, it is a good idea to include pretty much everything inside the try..except block. Finally you must setup the website where the error report is submitted. If you want to roll your own custom setup then take a look at the submit.php file which store the error report in the database. Five groups of information is collected beyond basic information such as date and time. OS name and version, kernel version, etc. Addon id, name, version, path, etc.